When we first see Crab Plover it is look like a bird make of cotton. We are stayed in central Gujarat, away from coastline where Crab Plover normally seen. 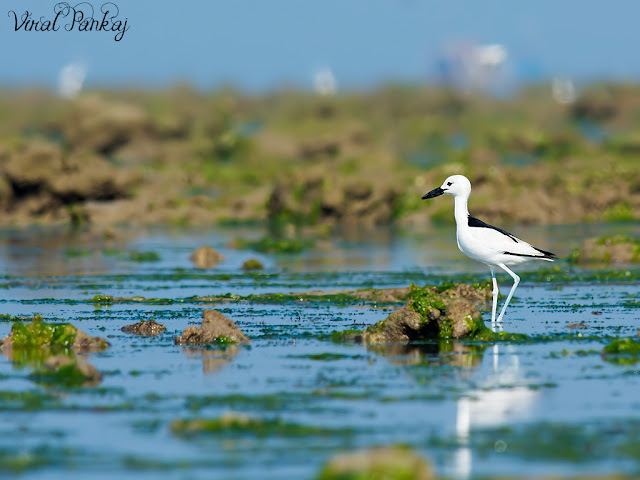 After seeing lots of Crab Plover post we decided to visit Jamnagar coastal areas. We planned for Jamnagar many times but due to some personal reason every time it postponed. Even this time we had faced many difficulties, such as to get rented room. When we reached Narara Marine Park we asked about the Crab Plovers. But we cannot see them because of high tide they went away from seashore. So we scheduled to visit again Narara next day at time of low tide. Next day we first did Marin safari and in the way back we saw Crab Plovers nearby shore. They were busy in trying to catch the crabs from high tide water. We saw around 40 Crab Plovers, some of them were Immature. They are noisy birds. Their feet looks sky-blue. Their long-necked upright posture with unique heavy-black bill makes them distinctive and unmistakable among waders. They looks so beautiful… so pure…so white…. !